GROZNY, Russia (CNN) -- Russian troops have offered civilians safe passage out of Chechnya's capital as a senior Russian officer repeated Moscow's pledge to avoid a direct assault on the city. In nine weeks of fighting, the Chechens have steadily retreated as Russian troops gradually encircled most of Grozny. Both sides have avoided a major battle, and the commander of Russian troops in Chechnya, Gen. Vladimir Shamanov, said he hoped to keep it that way. "Without question, there will be no storming of Grozny," Shamanov said. "That's why this conflict is so difficult for Russia, because it is happening inside our country. So we cannot permit ourselves to use the methods America used in Iraq and Yugoslavia." Shamanov's troops have continued to bombard the city from the air, but offered civilians a corridor to escape the attacks Sunday. Deputy Prime Minister Nikolai Koshman told NTV commercial television in Moscow that only a few noncombatants remain in Grozny, "and for these people, a corridor has been left in agreement with federal forces." Koshman, who is the Russian government's representative in Chechnya, said leaflets had been scattered around Grozny informing civilians of what route to take out of the city. 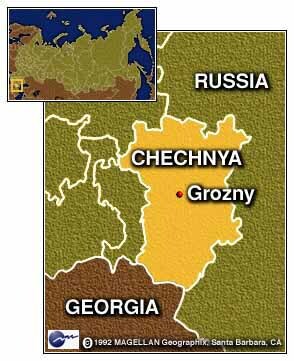 Russia moved into Chechnya in September, after a series of incursions into the neighboring Russian republic of Dagestan by Islamic guerrillas and a series of bombings in Russian towns. 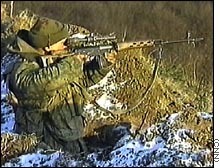 Russian troops have so far been hitting rebel positions from a distance with air and artillery strikes, avoiding the kind of close combat that cost thousands of lives and led to humiliating defeat in the 1994-96 war that led to Chechnya's effective independence. "I haven't really seen the enemy close up," one soldier said. "But the reconnaissance guys say they carry only light weapons, mostly home-made." The Russians have avoided large-scale infantry assaults in favor of air and artillery strikes. Rows of attack helicopters fill the sky over Chechnya on a clear morning, while Russian snipers peer out from behind trenches or on top of guns. Though the Russians have put off a move into Grozny, residents of the surrounding valley have no choice but to accept Russian authority. "The Chechen people are not meeting us with flowers. There is no need to pretend," Shamanov said. "But they are sick of living in a bandit world, sick of their children not going to school, and they are ready to work together with the Russian Army." Correspondent Steve Harrigan and Reuters contributed to this report.